I’ve often wondered what it would be like to work for a company whose workforce is distributed. That is, a company whose employees work from home (or other office space) and use the internet to do their work and communicate with their colleagues. Most of the time, the company I work for is staffed by on-site workers. But a recent construction project at our main campus forced a large number of us to work from remote locations. Thus, I enjoyed a rare opportunity to experience the life of a telecommuter for two weeks. There were a lot of things that I loved about telecommuting. There were a few unexpected drawbacks as well. Overall, it’s an experience that I would love to repeat, and get to know better. I saved time and money by not driving round-trip to the mother ship. My commute normally takes about a half an hour, so I saved an hour per day. That adds up to 260 hours per year. That’s the equivalent of 6 1/2 work weeks, or vacation weeks, depending on how you look at it. Also, it meant one less car on the road causing traffic and polluting the air. Better mental health. I slept an hour later on the days that I telecommuted. This, combined with the fact that I didn’t experience the stress of the morning commute, meant that I was happier and gave my freshest mental energy to my work. Better physical health. The natural light in my home office was a nice alternative to the fluorescent fixtures that illuminate the cubicle farm. I worked with my windows open, so I breathed a lot of fresh air. I was not tempted by the array of fattening snacks that well-meaning coworkers frequently leave out in common spaces. I did not breathe photocopier fumes, nor was I subjected to my coworkers’ colognes and fast-food smells. Silence. I loved that there were no distractions caused by people or machines. No beeping sounds, ringtones, email sounds, or text message sounds. No printer or shredder sounds. No incessant mouse clicks or clackity keyboard sounds. No fantasy football discussions or impromptu meetings taking place just outside my cubicle walls. I imagine that telecommuting employees with children, pets, or stay-at-home partners run the risk of being equally distracted by those influences. But I was completely alone, and I loved it. At one point my back yard was visited by a rafter of wild turkeys, but this provided a welcome afternoon break. The flow of work felt more natural. It seemed that my efforts were more task-based than time-based. The usual flow is: rush to get to work, work two hours, take a break, work two hours, eat lunch, work two hours, take a walk, work two hours, spend half an hour driving home. Repeat five times, then take two days off. Working from home feels more like: check messages, plan the day’s agenda, make some coffee, begin the first task, work until that task is finished, take a stretch break, begin the next task, respond to a request from a colleague, jog around the back yard for a few minutes, pick some chard from the garden, work some more, etc. The tasks seemed to unfold more organically throughout the day. I was every bit as available from home as I normally am in the office. In addition to my front-end web development responsibilities, there is a customer service aspect to my job, which I love. People have web- or design-related needs that they often don’t realize until the last minute. They call or email me for help. I solve the problem. They are grateful. I feel needed. It’s tremendously satisfying. Thanks to the work of the company’s IT department, there were systems in place that allowed me to do my job seamlessly from my remote location. I forwarded my office phone number to my home phone, and I could access all the internal resources I needed over a secure VPN connection. I was productive. I won’t claim that I was more productive than usual, but I would go so far as to say that I was equally productive. I attribute this to being happier, healthier, and less distracted, as noted above. 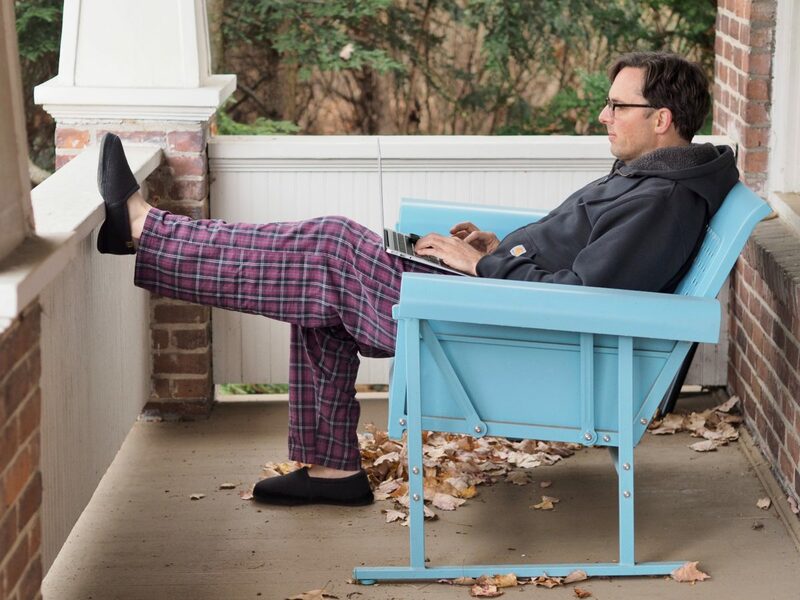 I’m not going to lie: I enjoyed working in my pajamas and slippers. I missed many of my coworkers. Even the ones who cause some of the aforementioned distractions. I am fortunate to work with great people, and for better or worse, we are like a big family. As effective a communication medium as the web is, there’s no substitute for a face-to-face discussion, with all the nuance and body language it provides. But I think that a meet-up once every week or two would suffice. I missed riding my motorbike. In the winter when it’s snowing, and when school is in session and traffic is dense, the commute is stressful. But in the summer when the weather is nice, I love to ride my motorcycle to work. I choose a mellow route that meanders over backroads through some beautiful, hilly farmland. It’s a nice meditation, and a nice way to bookend the work day. Network latency. I worked over a fast cable internet connection, but some unknown link in the chain throttled network speeds to a crawl. I’m not sure whether it’s simply the nature of VPN, or an under-provisioned server, or if it’s an issue with Adobe applications. Photoshop CC took 34 seconds to open a 52MB file off of a network drive, versus 7 seconds to open the same file saved to my local machine’s desktop. I quickly figured out that it was more effective to copy files down to my local machine, work on them there, then copy them back to the network drive when I was done. Telephone service. Out here in the country where I live, Verizon’s wireless signal is pathetic. Just about every phone call I take gets dropped or scrambled. This wasn’t a huge problem for my work, as I conducted most of my business asynchronously via email. But the handful of people who reached out by phone had to repeat themselves a couple of times. Time seemed to pass more slowly than usual. It felt a bit like jet lag at first. I attribute this to the absence of the habitual “structure” imposed by the normal work week: waking early, exercising, showering, donning the business-casual attire, commuting, etc. I created a new structure during my two weeks of telecommuting, but it felt unfamiliar, and it took almost the whole two weeks for my circadian rhythms to adjust to it. Obviously there are certain types of jobs (doctor, nurse, law enforcer, repair person, manufacturer, laborer) that require a physical presence at a particular work site. But for programmers, designers, writers, and other mostly computer-based professionals, telecommuting—even part of the time—seems like a reasonable and environmentally-responsible option. Kudos to the companies that trust their employees, and explore this modern approach to work.